Ten years after it was adopted to cool a conflict over logging of old-growth trees, the Northwest Forest Plan still provokes hot debate. The Clinton administration signed the landmark plan on April 13, 1994, to settle lawsuits brought by environmentalists and bring a level of peace in a battling region. The plan sharply reduced logging on 24 million acres of federal land in Washington, Oregon and northern California to protect the northern spotted owl, salmon and other threatened species. At the same time, it promised a sustainable supply of timber — including some from older, more commercially valuable trees — to boost an industry crippled by a ban on logging in millions of acres of national forests where spotted owls live. Critics howled from the start. "Everybody hated it, because nobody got all they wanted," said Jerry Franklin, a University of Washington forest ecology professor who helped write the plan. Whatever its shortcomings, the forest plan "accomplished a tremendous amount of good and created a tremendous amount of change," Franklin said. "I think what the Northwest Forest Plan symbolized was a major sea change in our attitude — how we are going to manage the federal forest stands, and what our priorities were going to be," he said. "And clearly it reversed almost a half-century of focus on commodity extraction." Former Forest Service Chief Jack Ward Thomas, credited by many as the plan's principal author, offers a less sweeping appraisal. "I guess what it achieved is, it complied with the law," said Thomas, now a professor of conservation at the University of Montana School of Forestry. While critics on both sides attribute all sorts of motives to the plan and its authors, Thomas said the driving factor was compliance with the numerous laws governing federal forests. 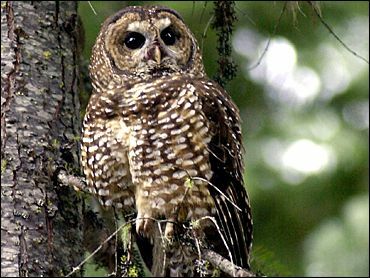 The National Forest Management Act and the Endangered Species Act, among others, forced officials to act to preserve the old-growth trees that serve as habitat for the spotted owl and other threatened species. Some environmentalists accuse the Bush administration of quietly dismantling the plan. "There's not much to celebrate 10 years later, because if the Bush administration has its way, the Northwest Forest Plan will die on their watch. And they hope nobody sees them doing it," said Andy Kerr, an environmental consultant from Ashland, Ore.
Administration officials dispute that. They say they are merely trying to correct the plan's shortcomings, while preserving its framework and approach. While the forest plan has largely succeeded in protecting threatened species, it has not ensured anywhere near the supply of timber promised a decade ago, said Agriculture Undersecretary Mark Rey, who directs federal forest policy. Current logging rates in the region are about one-third of the forest plan's stated goal of 1 billion board feet per year. A board foot is one foot square by one inch thick. It takes about 10,000 board feet to build a modest single-family home. Chris West, vice president of the American Forest Resource Council, an industry group, said the plan's impact on logging was even worse than business had feared. "To see an 80 to 90 percent reduction in timber production from northern California, Oregon and Washington is devastating," West said. He noted timber volume in the region has declined from more than 4 billion board feet a year in the 1980s to less than 400 million board feet now. West and other critics said the forest plan was overly rigid, especially "survey and manage" rules that require detailed study of the potential effects of logging on about 300 obscure plant and animal species. The rules, a late addition to the plan, have brought logging of region's old-growth forests to a virtual halt. In a major shift announced last month, the Bush administration moved to ease the survey-and-manage rules and boost logging of public lands — including some with older, more commercially valuable trees. Environmentalists decried the change, saying it could double logging on federal land in the region and have disastrous consequences for owls and other species. Rey, a former timber industry lobbyist, said 86 percent of the old-growth forest in the region remains protected and that environmentalists' fears are overstated.